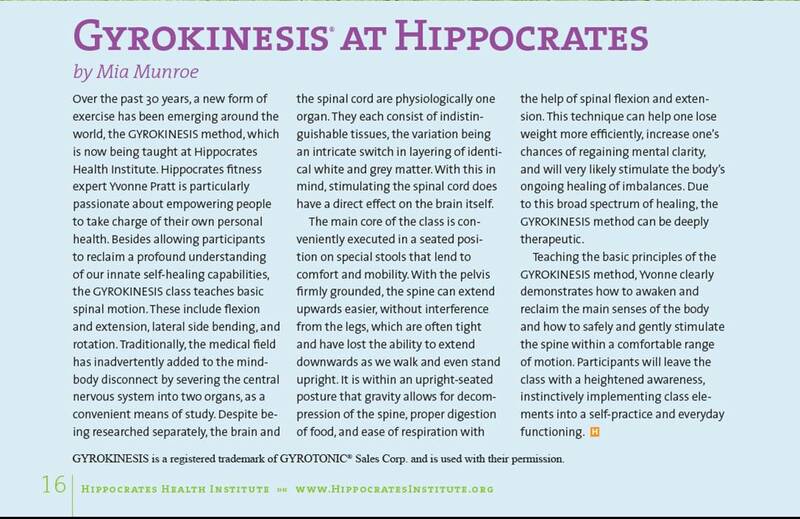 Over the past 30 years, a new form of exercise has been emerging around the world, GYROKINESIS® method, often empowering people to take charge of their own personal health. Besides allowing participants to reclaim a profound understanding of our innate self-healing capabilities, the GYROKINESIS® class teaches basic spinal motion. These include flexion and extension, lateral side bending, and rotation. Traditionally, the medical field has inadvertently added to the mind-body disconnect by severing the central nervous system into two organs, as a convenient means of study. Despite being researched separately, the brain and the spinal cord are physiologically one organ. They each consist of indistinguishable tissues, the variation being an intricate switch in layering of identical white and grey matter. With this in mind, stimulating the spinal cord does have a direct effect on the brain itself. The main portion of the class is conveniently executed in a seated position on special stools that lend to comfort and mobility. With the pelvis firmly grounded, the spine can extend upwards easier, without interference from the legs, which are often tight and have lost the ability to extend downwards as we walk and even stand upright. It is within an upright-seated posture that gravity allows for decompression of the spine, proper digestion of food, and ease of respiration with the help of spinal flexion and extension. This technique can help one lose weight more efficiently, increase one’s chances of regaining mental clarity, and will very likely stimulate the body’s ongoing healing of imbalances. Due to this broad spectrum of healing, the GYROKINESIS® method can be deeply therapeutic. A certified GYROKINESIS® teacher clearly demonstrates how to awaken and reclaim the main senses of the body and how to safely and gently stimulate the spine within a comfortable range of motion. Participants will leave the class with a heightened awareness, instinctively implementing class elements into a self-practice and everyday functioning.